As many of you already know, at Trittium we always try to develop our software. It’s cheaper, so we save our investors money. We get better products, 100% adapted to what we need. Greater ease for adaptations to future new uses. We avoid unnecessary lines of code if they are created by third parties. We have rights over the software that we create, which allows us, sometimes, to market it to third parties. 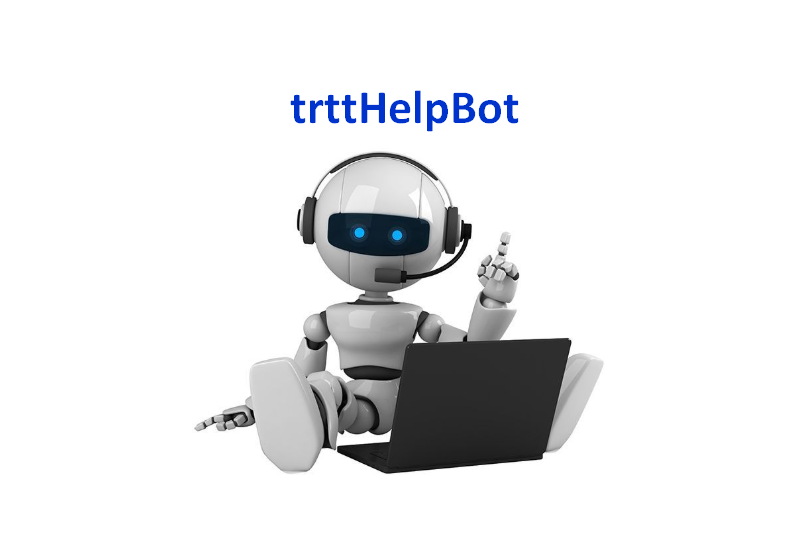 Today is the turn to introduce trttHelpBot. 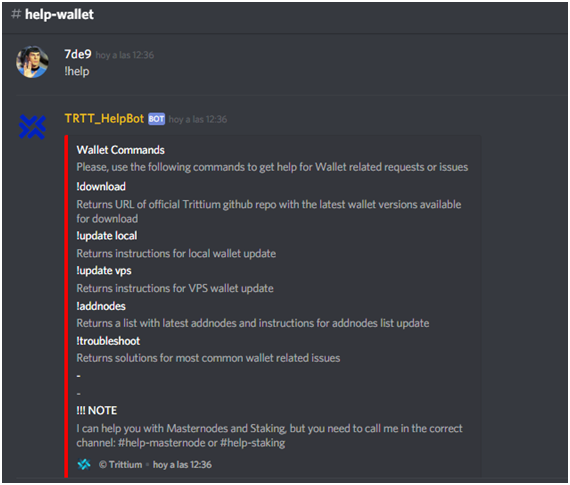 Developed by smuhter, member of the Trittium support team, trttHelpBot has the mission of helping the whole community with the most common support questions on a daily basis. 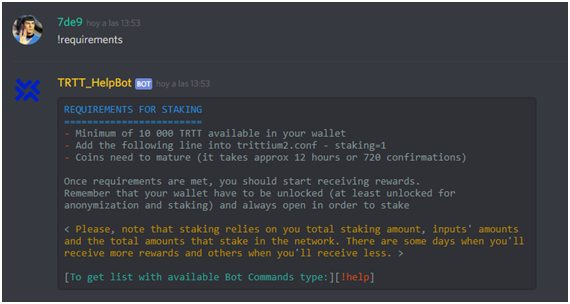 You can find the trttHelpBot inside the Trittium Discord server. 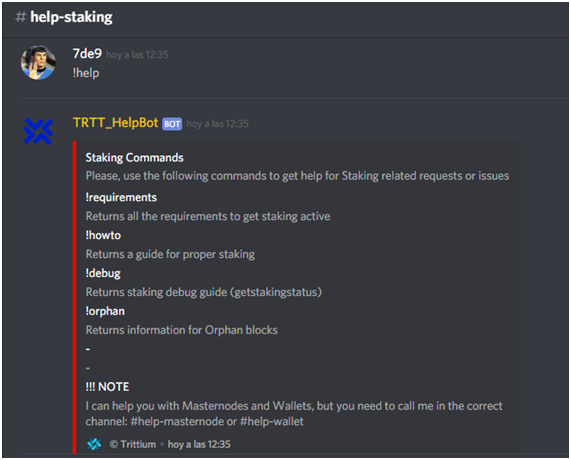 Channels #help-wallet, #help-masternodes and #help-staking. 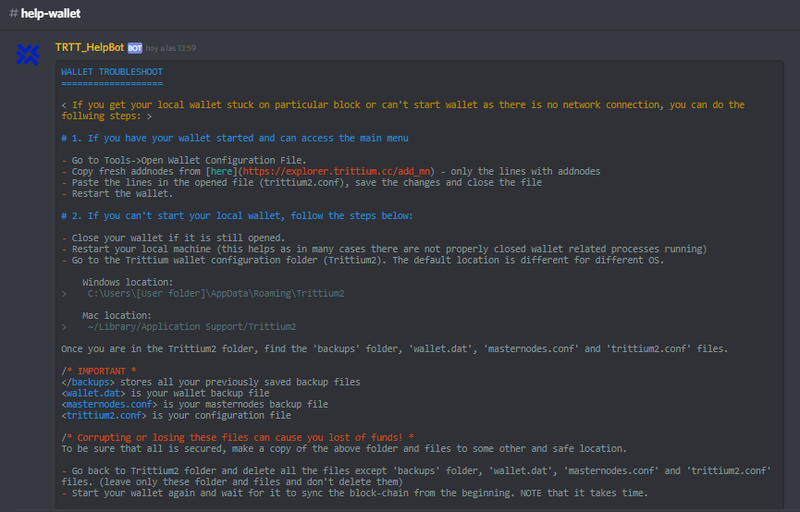 Within each channel solve doubts about each of the corresponding topics, that is, you can not ask for help about staking on the channel #help-masternode. Each of the channels gives the options to be able to solve for oneself 80% of the incidences that the members of our community usually have. Of course, we always try to have someone close, by in case these can not be solved through the bot. Getting it going is simple, you have to say hello when you get to the channel. “hello” “hi” “hey” “dear” “yo” “sup” “hiya” “morning” “howdy” “g’day” “g’day” “aloha” “ciao” “hola” “привет” “здравствуйте” “здравейте” “здравей” “здрасти” “nihao”. As you can see, you only have to type !help to activate it. From there, different options appear depending on which channel you run it. All your doubts about wallet malfunction. 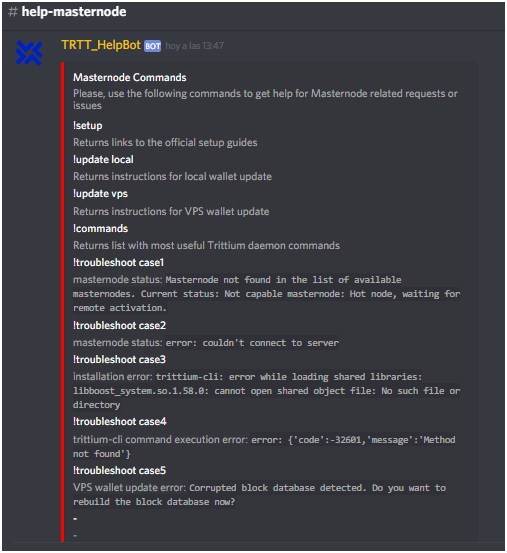 In the case of masternodes, in addition to the guides and basic instructions, the bot provides a solution to the five most common issues that we found. If you liked the article, please don't forget to clap!!! !